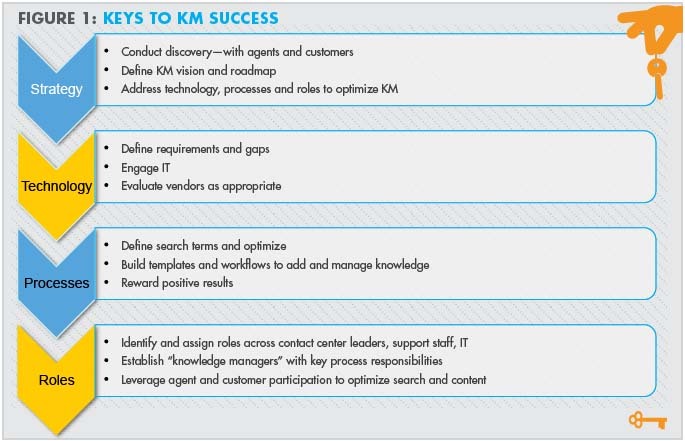 KNOWLEDGE MANAGEMENT (KM) is an Achilles’ heel for many contact centers. Some have an abundance of “tribal knowledge” scattered among a core of seasoned customer service representatives yet struggle to find ways to disseminate, update and use that knowledge effectively. Others have made investments in KM technologies but failed to make the tools appropriately accessible, relevant and time-sensitive. Content management: A database of knowledge items with targeted content to resolve customer questions and issues. Workflow: A configurable work process to add contributions and review existing ones for accuracy and relevance. Search: A reliable means to produce the right content in response to agent or customer input. When implemented properly, KM technology can reduce average handle times and increase first-contact resolution, improve customer service, bolster agent morale and stimulate use of self-service channels. To reap these benefits, the center needs to hit the mark on three key elements: the right strategy, the right tool, and the right processes to manage and maintain it. The concept of “Ready, Aim, Fire” applies as much to the challenge of KM as it does to hitting the bull’s-eye with a bow-and-arrow or nailing a free throw in basketball. If you are serious about making a quantum improvement in your center’s knowledge management while spending resources wisely, you need to invest the time to do it right. The “Ready” part of the equation calls for taking stock of where you stand with KM. It means identifying all of the repositories where you maintain relevant content as well as all of the available technologies to access them. You may be surprised by the number and diversity of resources—e.g., cheat sheets, binders, files in individual personal computers, file folders on the internal network, SharePoint directories, wikis, Customer Relationship Management (CRM) solutions, and (underutilized) KM applications. Stored documents use keywords and phrases that are unfamiliar to the people who are trying to access the information. As a result, the words they enter into the search fields don’t produce any (good) matches. Knowing what issues your agents face helps you to get a sense for the scope and complexity of your total knowledge requirements. If your customers tap knowledge through self-service (IVR, web or other), you’ll want to do a similar discovery process walking in their shoes. These efforts identify hurdles that may crop up as you tackle knowledge-based initiatives. The better informed about your KM past and present, the more likely you’ll make intelligent decisions for its future. Your strategy should contemplate the future state that you endeavor to create—i.e., the target toward which you’ll “Aim.” Ideally, your end state should support KM for all assisted-service channels and customer self-service options. It should define the breadth and depth of content needed to support each role and channel as well as how each knowledge element will be accessed. It should contemplate a search function that delivers the proper content on every use, based on words and phrases the user would actually enter. And it should limit the number of content repositories to simplify knowledge administration and ensure consistent information delivery across all points of access. When defining your strategy, consider how agents use knowledge aids when assisting customers as well as their role in managing and maintaining the knowledge resource(s), in addition to the resources that will be assigned direct “knowledge management” responsibilities. For example, you need to provide a means for agents to rate existing content, contribute new content, and send up a flare when important content is missing or out-of-date. Similarly, you’ll need to assess the customer experience with KM via self-service and incorporate their feedback into your continuous improvement efforts as well. The processes you define and resources and time you assign to leverage KM technology will be critical to success (more on these below). Having grappled with your KM present and envisioned your KM future, it’s time to put the time and effort into identifying the right tool(s) to hit the mark. Use all of the information gleaned while crafting your strategy to develop a detailed list of KM requirements. Document known gaps, inconsistencies and redundant information repositories. Articulate the preferred implementation phases (“roadmap”) and the rationale for the project priorities. Share your KM vision and requirements with your IT department. They may have experience with a variety of technologies used in other parts of the enterprise, including but not limited to SharePoint, KM, CRM, content management systems (CMS) and email response solutions. One or more of these technologies may be a good fit for the contact center while helping to minimize overlapping content repositories. You may also identify knowledgeable personnel within IT who can assist with designing your KM structure or building system interfaces, CMS databases, workflows and search engines. How will the solution organize and structure content from the existing array of resources? With which internal systems will the proposed solution require integration? Which repositories can be supplanted by the new solution? How will outside systems interact with KM—e.g., website access, email response systems? What tools are available to process/edit new contributions and review existing ones periodically for accuracy and relevance? How many levels of authority does your solution support? How are these levels assigned to personnel in a typical implementation? Through what means do you build and optimize your solution’s search capabilities to reveal context-specific knowledge at the right time? What role do we play in making that happen? How do you fine-tune your design and implementation to ensure that it is genuinely functional and user-friendly for our agents and customers? These educational and thought-provoking discussions will help refine your requirements and set the stage for preparing a formal Request For Proposal (RFP). While space limitations preclude a detailed discussion of the vendor selection process, you might consider reading a few other articles we’ve written for Contact Center Pipeline: “Technology Sourcing Decisions in a Complex Market” (September 2014), “Optimizing Technology Selection (August 2011), and “Defining an Effective Statement of Work for Technology Implementation Success” (September 2010). When you get ready to “Fire” up your solution, your contact center team will participate actively in the design process. You’ll work with the vendor to institute a knowledge organizing structure to optimize your search engine. As you assign search terms to each document, use words that customers use when asking about your products and services. Avoid internal jargon. Get agents to test-drive the solution and use their input to fine-tune your search engine. You’ll boost their confidence in the tool and establish a feedback loop that will remain active for the life of the solution. Search engine optimization is not a onceand-done process. Use reports from your technology (e.g., frequency of use, value of search results, etc.) to fine-tune your solution on a monthly basis. Reports combined with agent feedback help to ensure that the correct knowledge items surface based on the keywords agents enter and the terminology customers use. A well-tuned search engine is crucial for your KM solution’s success. To manage additions to your KM data base, establish a template for formatting input and a process to review new content for publishing. Use your KM solution to build the template. Use the solution workflow to route new content through the appropriate approval chain, allowing for editing along the way. Identify the appropriate keywords to optimize search, and then edit the information for a consistent look and feel. Institute a review process for existing knowledge items to ensure that they remain accurate and relevant for interaction handling months and years after the original publication date. Configure each knowledge form with a trigger for content review or a content expiration date. Define workflows for the review process consistent with the type of information provided and requisite level of authority. With a clear vision, the right technology and consistent processes to support it, KM can transform from an organizational “pain point” to a strategic asset. By consolidating and organizing information, first-contact resolution goes up, handle times go down, customer satisfaction soars, and agents become more productive and confident in their work. While KM nirvana may not be attainable, the technology and the organizational support to go with it merit a substantive effort by all affected parties to get as close to it as possible. Matt Morey is a Senior Consultant at Strategic Contact. It takes a village to build and maintain an effective knowledge management solution. The following table outlines roles and responsibilities that should be factored into the overall implementation. The primary strategist and decision maker who approves processes for managing knowledge. The individuals who review, edit and publish content. This role may be spread across multiple SMEs and may include individuals who are not part of the contact center. Smaller centers may have one person (and a back-up) assigned to the task who utilizes SMEs for content generation and approval. Defines processes for adding knowledge items and reviewing existing content. This individual provides oversight of content owners to ensure they are following consistent processes. Assists in configuring the technology to support the center and its KM processes. Ideally, this role is staffed by someone in the CC to avoid delays caused by competing IT priorities. Utilize this resource to assist with fine tuning your search function. Examines reports on the search function and the value of the content surfaced during searches. This analyst assumes responsibility for finetuning searches in cooperation with management and the front line.